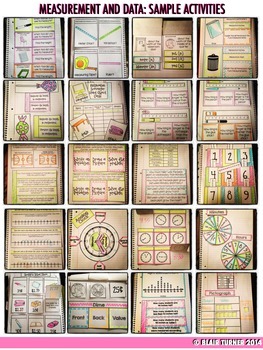 THIS IS A BUNDLED SET OF ALL MY 2ND GRADE MATH INTERACTIVE NOTEBOOK ACTIVITIES! Buy them together here at a huge discount! This mega-bundle is priced 20% lower than the price of all 4 bundles combined, and 40% off the price of all 26 individual files. 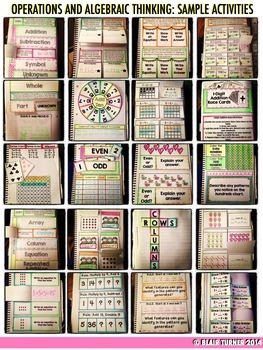 If you purchase this file, you are purchasing each and every 2nd grade interactive notebook file in my store! This set of interactive notebook activities will engage and excite your students all year. 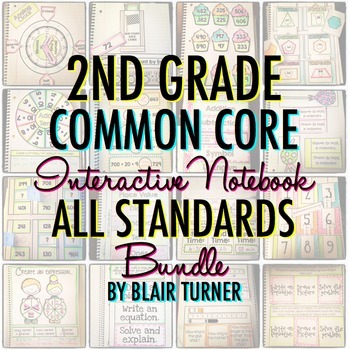 This mega-bundle includes a full set of activities to address EACH and EVERY 2nd Grade Common Core math standard! EACH standard has an I Can Statement and Vocabulary flapbook with definitions, along with a collection of flippable, foldable, and FUN interactive notebook elements. The activities are designed to review important concepts and dig deeper into each standard. Your students will LOVE learning with these fun activities - and you'll love the ease of having great materials ready to print and use for each and every math learning objective in the Common Core! This product is organized to help you plan. The files are all in folders according to domain. Within each domain folder, there are separate PDF files for each standard. Each PDF includes directions and photographs of the completed activities. I've updated this bundle to include an editable PowerPoint file to create your own vocabulary and I can statement flapbook. Two options are available: 3 word flapbook and 4 word flapbook. Although this resource is designed around the Common Core, there is a lot of overlap between the skills included in the CCSS and various sets of state standards. The editable vocabulary/I can flapbooks make this resource more versatile for anyone who is not using the Common Core, or for anyone who wants to adjust the vocabulary to align with a particular math curriculum. If you are interested in purchasing some of my interactive notebook materials, but don't need them ALL, you can buy each standard individually in my store! This is a great option for those that want to pick and choose certain topics to focus on. ARE YOU LOOKING FOR ASSESSMENTS AND TASK CARDS TO SUPPORT THE CCSS? 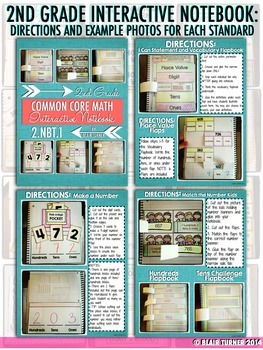 Make sure to check out my 2nd Grade Common Core MATH MEGA BUNDLE - A Year's Worth of Math Materials!